This week’s stitch on TAST2012 stitch challenge by SharonB is Palestrina knot. I had worked on this stitch on Previous TAST challenge. The related post is here. The beauty of the knot depends on The stitch tension and the yarn used for the stitch. last time the sampler was on plain fabric, after getting familiar with this knot, I tried some curves. This time around the same knot is worked on even weave. 1. I started with cone thread to familiarize again with this stitch, had not used this stitch on any of my projects. Learnt on the first row, cone thread is not suitable. So rest of the rows are worked in cotton skeins. 2. I wanted to use bugle beads, for this , three knots were worked in two levels. 2b.The same row with beads. 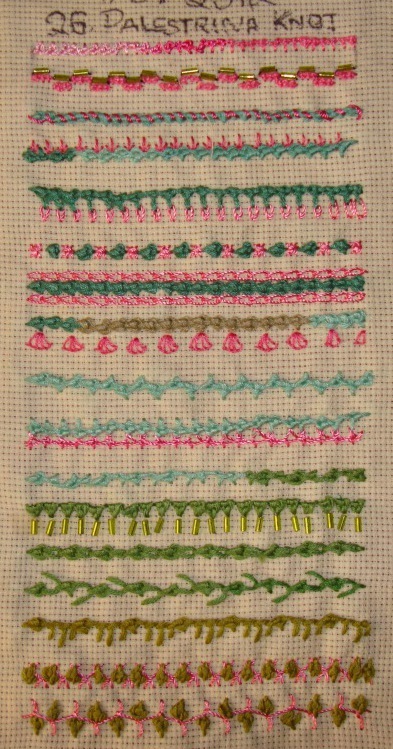 4.The first row is whipped with pink thread. The second row, individual fly stitches are worked over a row of Palestrina knots. 5Long armed palestrina knot with detached chain stitch. 6.Palestrina knots worked with double cross stitch. 7.in the first row, two rows of chain stitches are worked on both sides of Palestrina knot, the second row, a variation of buttonhole wheels are worked over a row of palestrina knot. 8.On the first row, I tried zig zag version of Palestrina knot, in the second row, cone thread is used for interlacing the row of Palestrina knot. 9. in the first row, alternate knots are looped only once. The second row , individual Palestrina knots done vertically. 9a. the row of individual knots are embellished with bugle beads. 10. the first row is palestrina knot in combination with chain stitch, the second row it is combined with feather stitch and the third row , it is combined with buttonhole variation. 11. individual Palestrina knots are worked over herringbone stitch in the first row, and over cretan stitch in the second row. With this row the Palestrina knot sampler is completed. I wish I was able to work this stitch with different yarns, cotton skein with six strands worked well for me for this stitch. Most people on this challenge have done wonderful experiments with this stitch, I’ll satisfy myself by enjoying their trials.